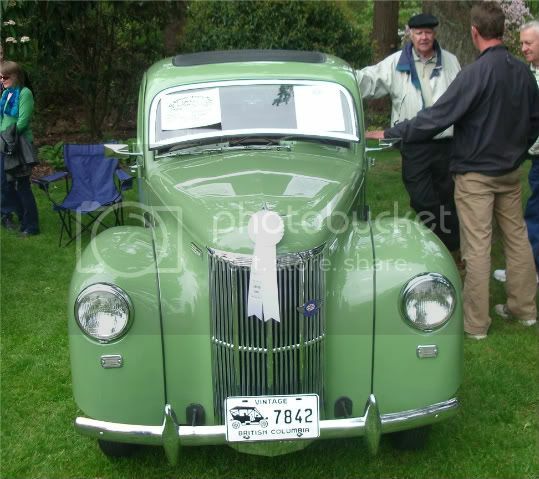 New to the forum, just bought a 1951 Ford Prefect and will be poking at it with a blunt instrument over the summer to see if it can be made to go faster, stop better and generally behave properly while still looking like an old car. It came with lots of bits including a spare engine/trans so I'll be throwing them up for sale over the next while. And I am still on the hunt for a RUST FREE (stop laughing!) MK1 Cortina GT - roller is fine. You have probably seen it around, I'll post pics once I get some done. I saw one this color at the Van ABFM a few years ago. Probably the same one. I'm not sure if it is the same one (don't think so) but I smile every time I look at it - wholly impractical, woeful performance, scary brakes etc - but I will attend to all these things in due time. I hope to scope out the engine which may end up in the car, this weekend. It looks to me very much like the prefect that was on BaT recently. The car was in BC and was available for a very reasonable price, if you ask me. Nice purchase. Yes, it has been a while but...the same week I found that Prefect, the Cortina I had been hunting for came up so I kept both for a while then sold the Prefect, drove the Cortina around for a time and then hauled the engine out and am ready for round 2. I have been hunting around looking for a good forum with a mix of the technical as well as people who care about these cars and so - here I am. I am mature in years but not quite the same in mind which is why I picked up my Mk1 Cortina GT a while back - my 4th MK1 (another GT and a couple of Lotus Cortinas back when I lived in Blighty, so I have the 'disease'). Car is LHD (I live in Canada) and was completely rebuilt by the previous owner, lots of new panels, lots of welding and he had installed a Fiat 1.8 Twincam/5peed which was fine but not quite enough so after a bit of thought that was sold to a young'un to put into his Mk2 and I picked up drivetrain from a Honda S2000 - 3 times the original horsepower should be a start - and plan to stuff that in place in the coming months. As someone who has owned 2 V8 powered MK1s over the years, I say good on yer! Welcome. A few years ago Clyde Bailey owned a Mk1 GT with a Fiat engine and 5 speed installed. He lived near the Alameda Marina at the time. I know this car, it used to belong to Fred and he did some great bodywork to the car. I do recall giving him some parts for it years ago from a Mk1 I was parting out at the time. Will you have it at the ABFM this year?? I will be there with my Anglia 100e, class #54. I looked at the V8 option but wanted to stick with a 4 cylinder high revver which I could get parts for and the S2000 kept calling my name. I don't think this ever left Canada Pete. This was Fred's car and the bodywork was indeed great - he gave me access to the build photos - Fred had noticed my search for a GT in good condition and passed me on to Mark C who owned the car. ABFM? maybe next year, got a lot of cutting, fabbing and welding to do first, new engine mounts, and I suppose I need to cover over the now massive hole where the trans goes - that Honda 6 speed is a lot bigger than the original 4 speed! Looks interesting, keep us updated on your progress.